Texas is indeed a state of mind, and I loved growing up there and attending college there (sic ’em Baylor Bears). As we Texans like to mention to non-Texans with pride, we were our own republic for almost a decade, from 1836-1845 (if anyone wants to know). And since President James Polk signed legislation making Texas the 28th state on December 29, 1845, it was pretty much ten years anyway. To start the month, March 2nd marks “Texas Independence Day,” the day that Texans celebrate the 1836 signing of the Texas Declaration of Independence that created the Republic of Texas. Then, four days after the new republic was formed, on March 6, 1836, the famous stand-off at the Alamo occurred, in which all of the Texas troops fighting under Colonel William B. Travis were killed (think Texas legends like James Bowie and Davy Crockett). The bravery of the fighters at the Alamo inspired Sam Houston and his men, who on April 21, 1836, waged the Battle of San Jacinto against Santa Anna and his army. The battle cry at San Jacinto was, of course, “Remember the Alamo!” as the Texas soldiers defeated Santa Anna and started the process of independence for what would eventually become the Republic of Texas (after a few more years of battles and bloodshed). Texas has a long, complicated history, and as my grandparents and parents like to say, the people who inhabited the volatile territory so many years ago were “tough as nails.” I vaguely remember my great grandmother, who raised my grandfather and his siblings on a farm in central Texas that has been in our family for almost 100 years, and she was indeed one tough (yet charming, in the Southern way) lady. Being Texan means more than having a heritage. It means being able to say “ya’ll” without it sounding like improper grammar, having the ability to say something not so nice with a drawl that makes it sound pleasant, getting antsy when you haven’t had Tex-Mex or good barbecue in a few days, and still feeling Texas pride no matter how far away you are from the motherland. According to news reports, about 300,000 people traveled from the D.C. area to other parts of the country for the Thanksgiving holiday last week. I was one of them. Although most of my friends think I’m crazy, I absolutely love airports. As I headed to Ronald Reagan National Airport to catch my flight from D.C. to Dallas, I could feel myself begin to relax. Perhaps this isn’t normal, but airports actually have a calming effect on me. After all, going to the airport means that you’ll be transported somewhere and have a change of scenery. Not to mention that at the airport you can curl up in the waiting area with a good magazine or book and let the world pass you by until it’s time to board. I landed in Texas happy to see my family, but also wishing that Leon was with me. He spent Thanksgiving with his family in North Carolina; his sister Julie is in the marching band at UNC and had to perform during the football game, so his parents flew in from Colorado and he drove down from D.C. so that they could all spend the holiday together. We decided that I would head down to Texas to visit with my family, but would travel together to see both sets of families for Christmas. But back to Thanksgiving. I arrived safely in Dallas, and my dad and I chatted while we drove to my parents’ house in McKinney where I had grown up. I already felt myself becoming sentimental as I put my backpack in my old room, and as I usually did, walked around looking at my things still perched where they had been for so many years. I looked at old pictures from high school, shuffled through the Prom dresses still hanging in my closet, and thumbed through college textbooks still on the bookshelves. Every time I go home it’s a trip down memory lane. Then it was time to cook. My grandmother was visiting, and she, my mother, my sister-in-law Leah, and I worked together to cook a traditional Southern Thanksgiving meal. (This meant that several dozen sticks of butter lost their lives that weekend). After a whole lot of work, the table was set and it was time to celebrate Thanksgiving as a family. My dad was home from work, my brother Taylor was home from Baylor, Mimi was there from Groesbeck, Texas, and my brother Andrew and sister-in-law and Leah came from Frisco, Texas. Mom and I gave each other a congratulatory hug before diving into the goodies. The thing about cooking that I am still fascinated by is that it takes hours–or days–to prepare a feast, but less than half an hour to actually eat everything. We all scarfed down turkey, stuffing, sweet potatoes with toasted marshmallows on top, lime congeal salad, mushroom and broccoli casserole, pecan pie, and everything else that constitutes a Texas Thanksgiving offering. It was all wonderful. After enjoying a semi-comatose state from eating so much, my mother and I went shopping in Dallas for my wedding dress. It did cross my mind that that was perhaps a very unwise thing to do…But I figured that if I looked okay in a dress after Thanksgiving dinner, it would probably look okay under normal circumstances. There’s something about a girl going shopping with her mother. In the course of one afternoon, amidst the crowds congregating at shopping centers for post-Thanksgiving sales, my mother and I managed to find my wedding dress, veil, sash, and shoes. We probably burned off about half a stick of butter running around Dallas too–mission accomplished. It was a good Thanksgiving, and had a mix of sentimental aspects involved. For nostalgia, I was in my old room, where I had grown up, and ate all of the traditional Thanksgiving food that we’d had since I can remember. For present day consciousness, I found my wedding dress and was hit with the exciting, fluttery feeling that in the next few months I would get to marry my best friend. I felt very humbled by how much the Lord had blessed me over the years, through good times and bad times, and was overwhelmed by a sense of thankfulness for friends and family who had walked with me every step of the way. I guess that those are the best kinds of holidays to experience–those in which you pay homage to your past, keep your eyes focused on the great things to come, and take time to be thankful for previous and present blessings. As we all know, life gets busy. I had tried all September and October to plan a time to head to New York City to enjoy its full-blown autumn splendor, but work and everything else zapped up the time. So, I had pretty much resigned myself to the thought that I would have to try again next year. Then my very considerate fiancé stepped in and surprised me with a trip to NYC for my 29th birthday on November 12. It worked out perfectly–my birthday fell on a Saturday, and Leon worked quietly behind the scenes to plan a great present. When he told me the surprise plan, I squealed and could hardly contain my excitement. After all, by that point I was fine with the idea of spending the beginning of my last year in my 20’s in front of the TV. It turned out to be an incredible birthday, and also an incredible culinary tour of NYC. I realized after we returned to D.C. that, in every single picture I took in New York, we had a plate of food in front of us. (Good thing that calories don’t count on your birthday). Leon and I hit the road early and made it to New York with plenty of daylight left to spare. The weather could not have been more perfect–cool but not cold, crisp but not too chilly. The leaves were all vibrant shades of red and orange, and the entire city looked like it was dressed up for the season. It was a fantastic sight to see. We certainly managed to cram plenty of sightseeing and eating into our trip. To start, we took a walk around Midtown to see the Rockefeller Center Christmas tree being set up, strolled through Times Square, and visited St. Patrick’s Cathedral. I also had the chance to fulfill my autumn fantasy of getting a pumpkin spice latte at Trump Tower on 5th Avenue and strolling down the street admiring the window displays. And of course, we ate. I read somewhere that, even if you ate at a different place in New York City for every meal, it would take years to try every single place. Leon and I certainly did our best to put a dent into that number–we packed our Tums and hit the town, hungry for gastronomic adventure. To start, we grabbed steak at Gallegher’s Steakhouse for my birthday dinner. Gallegher’s is a favorite haunt of celebrities, apparently, and is in a great location. Madonna was playing a concert across the street, and the coat check lady (who looked like she was about 80 years old and, according to her, had been around New York forever) informed us matter-of-factly that she had met Madonna years ago, and, “you wouldn’t look at her twice if you saw her on the street!” We laughed and proceeded to dig into our steaks with gusto. Being in New York, we also had to grab some real NY style pizza while we were there. Leon and I tried to do a proper pizza crawl, but after enjoying pizza from Angelo’s and Ray’s, we both had to take a break. The pizza was delicious, but we had to save room for dessert. And boy, did we save room for dessert. 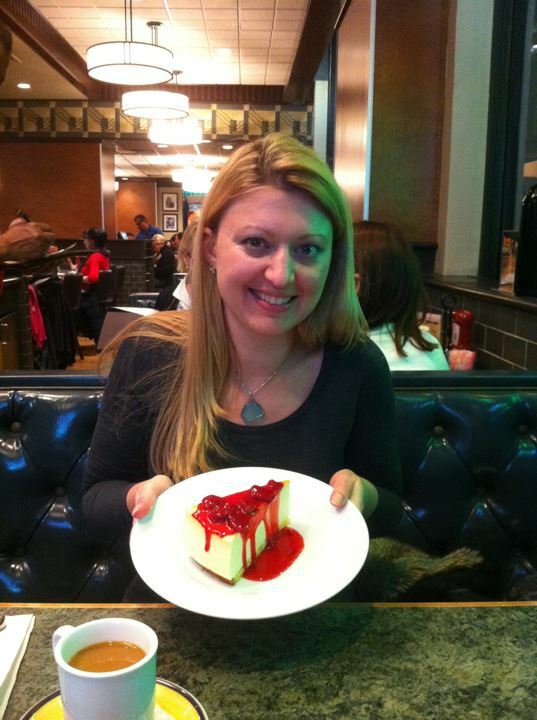 I took Leon to two of my favorite dessert spots in the Big Apple, Lindy’s Cheesecake and Serendipity 3. I don’t know how, but our stomachs were able to handle slices of creamy NY cheesecake and decadent frozen hot chocolate alongside the copious amounts of steak and pizza. In between eating, we also strolled around the city and made our way down to see Ground Zero. The last time I had been down to the site, about a year ago, there was not much construction going on, and the giant craters were still present to bystanders. This time, however, the initial work on the new 9/11 Memorial and the new structures (fountains where the original buildings stood, a new World Trade Center building, and a transportation hub for new subway trains and ferries) looked like they were coming along nicely. It always makes me emotional when I go down to Ground Zero, and Leon and I both stood there quietly for a moment reflecting on that sad day in our nation’s history. We agreed that it will be interesting to see what it looks like upon completion. Then, in a New York minute, it was time to head back to D.C., and back to reality. We both laughed on the way home that we had managed to squeeze about 10 meals into our trip, and we talked about how good it was to get away and explore such an exciting city. It was a wonderful way to celebrate my 29th birthday, and I’m so thankful to have a thoughtful fiancé who made my dream of returning to New York in the fall a reality. I also figure that, by the time we digest everything we ate, it will be time to return for more! Sometimes, even when you live in a city that others flock to for vacation, it’s easy to forget that you live in a really cool place. I first learned this while living in Rome and, much to my horror, walked by the Spanish Steps one night without even blinking at their grandeur, like they were just another set of old marble stairs. The same thing has happened to me in Washington, D.C., after living here for almost two-and-a-half years. That time has flown by here in the U.S. capital, and like most long-term situations the initial sense of novelty and awe has faded into the background of the daily grind, i.e. the day-to-day routine. For instance, the typical routine of a young professional in D.C.: Wake up early to drag yourself to the gym, make a strong cup of coffee, groggily ride the Metro to work, get into “the zone” at the office, do your best at work, and groggily ride the Metro back home to scarf down some dinner (or groggily meet up with friends to scarf down some dinner) before catching some z’s and beginning the process over again. They say to “stop and smell the roses,” and today I did just that, albeit completely by accident. I’d taken a lunch break to run over to Good Stuff Eatery, close to the House of Representatives and a favorite burger joint of congressional staffers, to say hello to my friends Aaron and David, both of whom are buddies from my first days in D.C. and both of whom I had not seen in ages. We caught up for a bit before I needed to head back to the office and began the brisk walk back. Or so I tried. I hadn’t planned to walk the twenty minutes to see Aaron and David that day, and that morning I had picked out a pair of cute high heels to go with my dress. It soon became clear that it was not the day to wear high heels, and my brisk walk morphed from quick strides to slow paces to a limping shuffle. (Any girl who has tried to walk a long distance in high heels can quickly empathize). 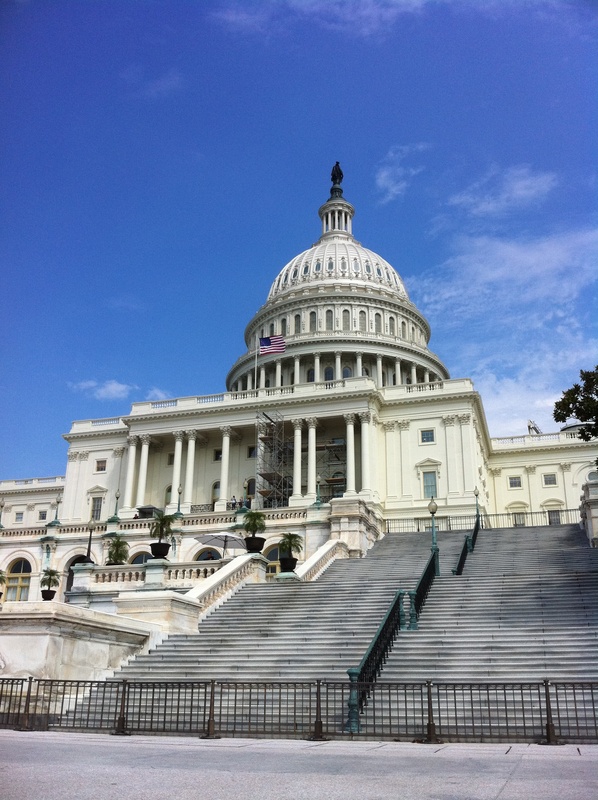 As I limped along, I found myself walking in front of the U.S. Capitol. I’ve walked in front of the Capitol and the National Mall dozens of times, but this time I was pretty much forced to make it a slow jaunt. I noticed groups of tourists standing around, just looking up at the imposing building with their mouths open in awe or snapping away with their cameras. Before I knew it, I too was taking some photos with my Iphone and enjoying the beauty of the city. I even think my mouth was gaping open at one point. After taking some photos and resting my throbbing feet for a minute, I made it back to my office, thankful to be able to sit down. I was also thankful, in a way, to have been forced to slow down and be reminded of where I live. Looking back on the 2.5 years, from when I first arrived in D.C. as a wide-eyed young professional not knowing what lay ahead, to the blessing of having the job I do now, I was reminded at how cool Washington, D.C., really is. For all of its intensity, power trips, frustrations, and randomness, it really is a beautiful place. I’m glad that I was reminded of that today. And after I ride the Metro home, I’m going to soak my feet. The next time I “stop and smell the city,” I’ll try to wear flip flops.